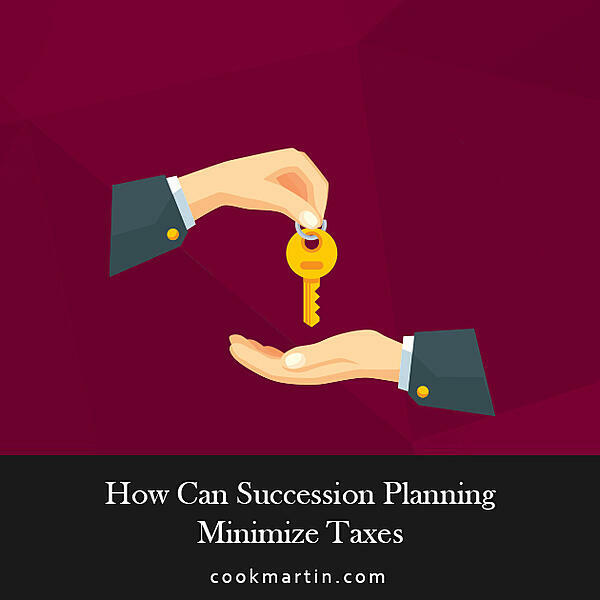 How Can Succession Planning Minimize Taxes? Small and medium-sized businesses are the backbone of the American economy. One of the issues that’s an ongoing debate is how much of the tax burden they should bear. If you own a business and you haven’t made concrete plans for what will happen when you retire or die, you might be wondering if succession planning is worth your time. At Cook Martin Poulson, we work closely with our business clients to help them develop succession plans for their businesses. It can give you the peace of mind that, should the worst happen, your business will have a plan for moving forward. Not only will a plan minimize any confusion about who’s in charge, but it can also minimize your taxes now – and the taxes your heirs will pay in the future. Here’s what you need to know about how business succession planning can minimize your taxes. A family limited partnership, or FLP, is one option if you want to help your heirs save money on taxes when they take over your business. FLPs work by having you retain general partnership rights while transferring limited partnership rights to the person (or people) who will take over your business. This reduces your tax burden in two ways. It reduces the amount of your taxable estate. Because you’re transferring some of the value of your business to your heirs, you’re effectively removing it from your estate for federal estate tax purposes. And, you’ll still retain control. Transfers of limited partnership interests are eligible for the annual gift tax exclusion. The value of limited partnership shares can be reduced by law when they are transferred, which limits the amount of taxes your heirs will need to pay. The 2017 Tax Cut and Jobs Act increased the federal estate, gift, and generation skipping exemption to $11.18 million per person or $22.36 million per married couple. Setting up an FLP also protects your assets from spouses of failed marriages and the claims of future creditors. You can structure the FLP to require a transfer back to the family for fair market value. There is one significant caveat with the FLP. The Internal Revenue Service tends to look at FLPs with some scrutiny, and states may do the same. It’s always a good idea to get legal and accounting advice before setting up a FLP. As you look to the future, another way to save taxes both now and when your heirs inherit your business is by amending the corporate structure of your company. The Tax Cut and Jobs Act of 2017 reduced the top federal income tax rate for corporations from 35% to just 21%. While some provisions of the 2017 Act sunset (meaning run out unless specifically extended by Congress) on December 31, 2025, the corporate rate cut does not. If you (or your heirs) plan on selling the business in the foreseeable future, it probably doesn’t make sense to switch to a C corporation. That’s because a C corporation is a separate entity for tax purposes and you’d end up paying taxes as an individual and as a corporation. If you’re making long-term plans (for example, if you’re still reasonably young and you intend to continue controlling your business for a long time), then you should be aware that the increased gift exemptions sunset on January 31, 2025. While there’s limited likelihood that the changes won’t be extended before that date, you should still know and be ready to make changes accordingly. Here again, it’s a very good idea to get professional help with your succession plan. Depending on the size of your business and its assets and liabilities, you may be better off retaining your current legal structure and addressing your tax returns in other ways. Eligible taxpayers may be entitled to take a deduction of up to 20% of QBI from a domestic business that operates as a sole proprietorship, partnership, S corporation, trust, or estate. Individuals earning more than $157,000 or couples earning more than $315,000 may be limited in their ability to take the QBI deduction based on additional phase outs. Likewise, eligible taxpayers may be entitled to a deduction of up to 20% of their combined qualified real estate investment trust (REIT) dividends, as well as for qualified publicly traded partnership (PTP) income. An amount equal to 20% of the taxable income minus the taxpayer’s net gain. The QBI deduction will be available for taxable years beginning after December 31, 2017, which means that your 2018 tax return will be your first opportunity to claim the QBI deduction. You should know that you may take the deduction if you qualify whether you itemize your deductions on Schedule A or take the standard deduction. The goal of the QBI deduction was to achieve near-parity with the corporate tax cut rate. It doesn’t quite reach parity with the corporate tax deduction, but it does lower the top marginal tax rate on the QBI to 29.6 percent. Does the income in question qualify as QBI? Is your taxable income too high to qualify for the QBI? If you qualify to take it, the QBI can help reduce your tax burden now and the burden of your heirs in the future. You can find a more detailed explanation and some answers to frequently asked questions about the QBI on the IRS website, here. And here again, of course, it is a good idea to get advice and guidance from a professional accounting with business succession planning experience before you make any decisions. The bottom line is that business succession planning is a must for every family-owned business. The planning and organizing you do now will minimize conflict when you retire or die. And, as we have shown here, it can also save you money on taxes both now and in the future. We understand that succession planning can be a difficult thing to discuss, or can seem simply unnecessary. However, we believe it is a crucial part of any successful business. If you have questions or concerns about how to proceed, or would simple like to learn how CMP’s team of experienced Utah estate and succession planners can help you, we encourage you to contact us. Succession Planning For a Family Business: Should You Sell or Pass Down? Troy is a shareholder of the firm in the Logan office of Cook Martin Poulson, PC. Troy works as a facilitator for family owned businesses through succession and strategic planning processes. Copyright © 2019 - Cook Martin Poulson.